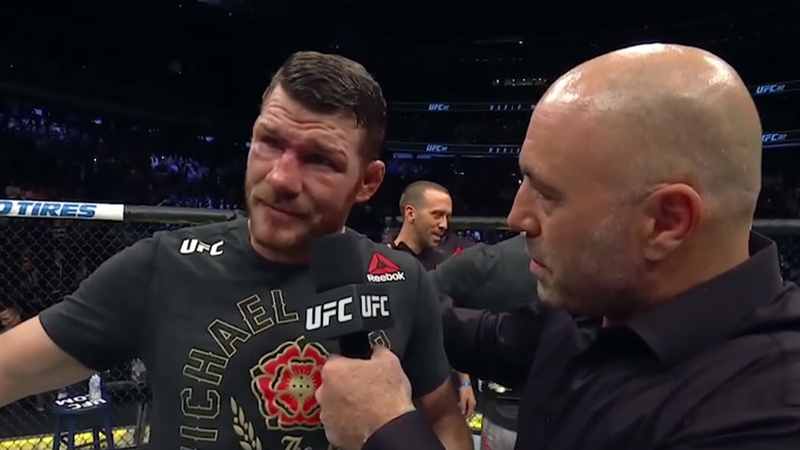 Former middleweight champion, Michael Bisping suffered the loss against Georges St-Pierre via technical submission in the third round in the main event of UFC 217 pay-per-view (PPV) earlier this month in Madison Square Garden. Three weeks after losing a middleweight title, Bisping was back in action against Kelvin Gastelum this past Saturday in Shanghai. Unfortunately for Michael “The Count” Bisping, it took Kelvin Gastelum less than one round to put him away with a brutal knockout (watch that here). UFC color commentator Joe Rogan told his podcast listeners, where he voiced his displeasure on UFC’s decision to let Bisping compete so quickly so soon after being dumped by St-Pierre (GSP). “I don’t think you should be allowed to fight three weeks after you have a brutal fight like Michael Bisping did with GSP. He got rocked, he got choked unconscious, and then three weeks later, he’s fighting a really dangerous young and up-and-coming Kelvin Gastelum. Kelvin is a beast. . .
Rogan continues, that is short-sighted and risky thinking because Michael Bisping is never going to say “no,” even if he should. Moreover, Bisping did admit that he was “mentally wounded” from losing the title to Georges St-Pierre, he said he felt physically fine, the reason why he immediately jumped in the opportunity when Anderson Silva’s failed the USADA drug test. Rogan, meanwhile, believes it was not a smart idea. “You really have to protect the fighter from themselves. You really can’t be letting a guy fight three weeks after an absolutely brutal fight like that. It just does not make sense. It does not make sense. I don’t think it’s smart. It’s slightly longer than a few weeks but Bisping is in fact looking to have another pretty quick turnaround: the former middleweight champ has his sights set on a retirement bout when the UFC returns to London next March. Slightly over three months is still not a lot of time to recover, especially when a good part of that will be involve Bisping sparring in the gym, not allowing his brain to recover properly. And that’s the problem, Bisping is too tough for his own good. “Someone was talking about him fighting in England, I believe in March. Boy, that’s less crazy, but still, crazy because we’re basically into December. So you’ve got December, January, February, three months off, really, and then March. But during that time he’s going to be sparring and you know Bisping, he’s a f**king animal. He’s not gonna take much time off. Michael Bisping has been open about one last fight before hanging his gloves for good and intends to make it happen when UFC returns to London in April of the coming year. Rogan’s remarks echo the words of MMA Fighters Yoel Romero and Ben Askren who both voiced their displeasure with the UFC’s decision in letting Bisping fight Gastelum so quickly.